I'm lucky to live near 2 fabulously talented food and party blogger friends, Christine of Pure Joy Events and Heather of Chickabug. It was such a pleasure to collaborate with the 2 of them previously, so I was excited when Christine suggested we team up again for a special Mother's Day project! 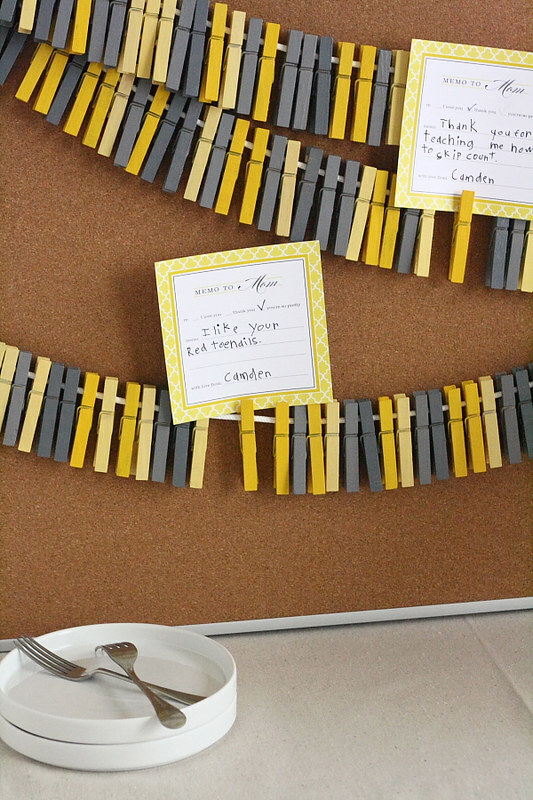 For our latest undertaking, Christine made this fabulous memo board of colorful clothespins to provide the perfect setting to show off memo to Mom cards custom-designed by Heather. 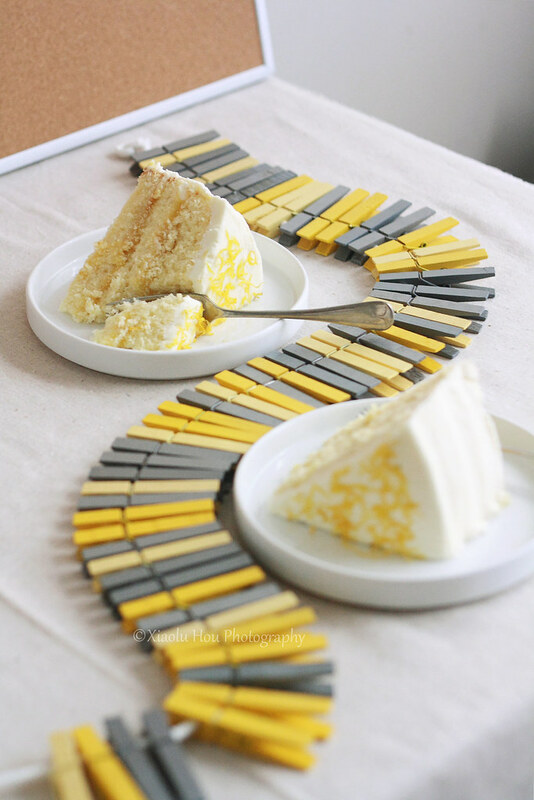 And I added a measure of sweetness with my Tart Lemon Cake! 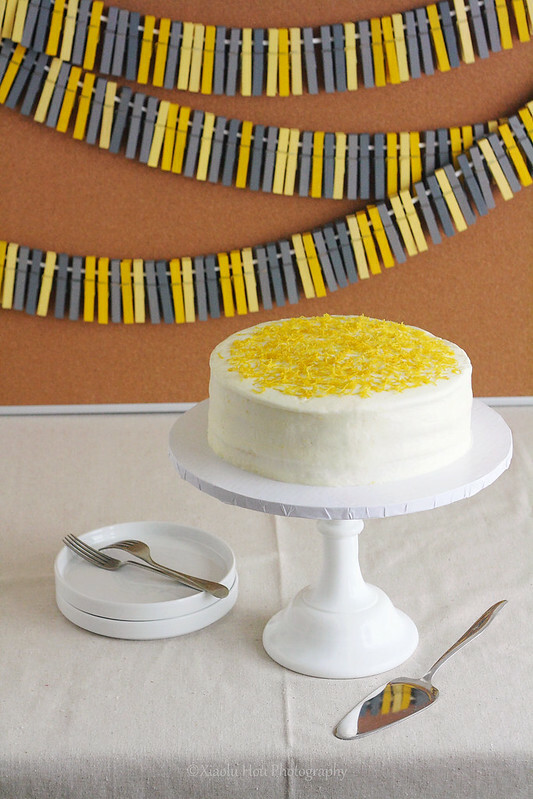 Please head over to Pure Joy Events for the full cake recipe and to Chickabug for the Mother's Day memo board tutorial, FREE memo to Mom printable, plus the lemon cake recipe card. You can also find a plain-text printable version of just the cake recipe here. The clothespins are fantastic idea! And I love your photo up top with the reflection on the cake server! What a lovely cake! Heading over to Pure Joy Events. Beautiful! Love the simple and clean way you chose to frost it. Have a great weekend! That cake looks so simple, and is so stunningly beautiful. Any mom would go nuts for this! Still savoring your cake, Xiaolu! Wow Xialolu! This cake is so pretty! I MAJORLY wish I could make a lemon cake for mother's day but my father HATES citrus. Hmm maybe I'll do it anyway....it's not HIS holiday. Off to check out the recipe! Beautiful display! That cake sounds and looks amazing! This is gorgeous. The cake is to die for.